Welcome to Enterprise House. We are based in Bishop’s Castle but serve the wider area of South West Shropshire. 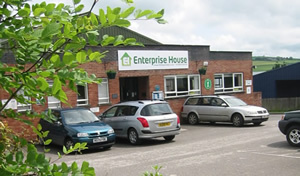 We manage the building called Enterprise House with a range of offices and workshops as well as our own facilities. Our building also houses he Local Public Library as well as the Council Registrars Office and Customer Services. Our other projects are detailed within the website. Check the menu to look at the IT Centre, the Village Outreach equipment hire service, our Artificial Sports Pitch and, of course our amazing SpArC Theatre. The Company is run by a small highly dedicated team supported by a volunteer board of directors. The company is a Social Enterprise; all of our income is put to work providing important local services to the South West of the county.